What could be better than a rock for your mother on Mother's Day? No? Maybe a beautiful mineral specimen? Maybe a fossil? Or how about a stunning piece of handmade jewelry? Whatever mom's taste may be, she is sure to appreciate a gift from the earth and the best place to find one of those (a clean one anyway) is at the annual GMS Mother's Day Gem & Mineral Show! 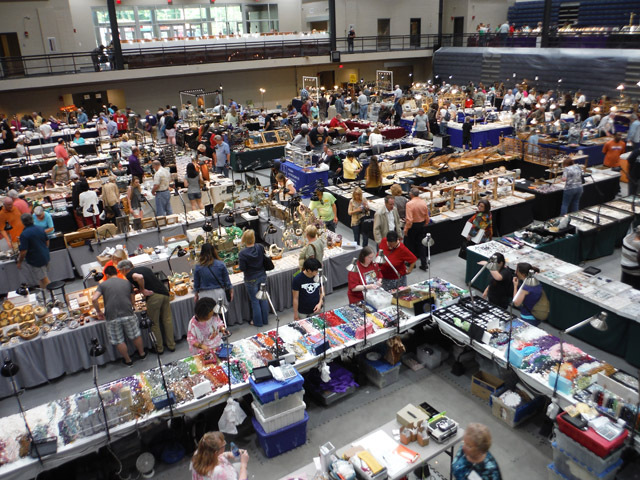 Held every Mother's Day weekend, this show draws dealers from all over the country as well as people eager to peruse and purchase unique items. The entire show is planned, prepared, and executed by GMS member volunteers. From cutting, sewing, making, and filling grab bags for kids to setting up display cases, feeding dealers and volunteers, managing dealer contracts, show advertising, demonstrations, auctions -- there are many things that GMS members do to make this one of the best shows in the Southeast. So even if you don't volunteer, come to the show and support the hard-working members and dealers who do their best to entertain you. See the contact page for the show committee. The May Show will be here soon!!! We still need volunteers! It is always fun to help with the show – and you get to talk with members you may rarely see, and the dealers who have so many wonderful things to buy. Even if you can’t work at the show, be sure to come look around, and wear your name tag or volunteer tag as you walk around – the dealers appreciate the presence - and the business - of the club members. Again, to volunteer, use [the link in the May Tips & Trips newsletter]. Or sign up at the meeting on a paper list. Hope to see you all at the show!